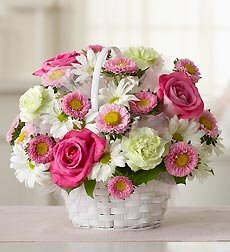 Celebrate the blessed event of a new baby with this beautiful fresh bouquet of roses, carnations, daisy poms and more, arranged in a handsome reusable basket to congratulate the new parents in style. New Baby Girl Basket features roses, carnations, daisy poms, asters and salal, accented by beautiful pink tulle woven throughout New Baby Boy Basket includes roses, carnations, daisy poms, button poms, statice and salal, artistically designed with blue tulle woven throughout Each bouquet is arranged by our florists inside a charming 8"H white handled basket Components may vary Large arrangement measures approximately 14"H x 14"D Small measures approximately 14"H x 12"D What's The Story? What a great and practical gift for the new parents! After the flower arrangement has faded, they can use the beautiful basket to hold baby's toys or cherished mementos.